The Washington Rotating Lubricator Model 1019 is a pressurized system designed to give long trouble-free service to all of our rotating assemblies. 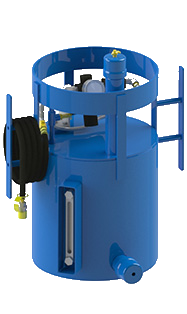 This system provides a continuous source of fresh oil to the rotating assembly, completely submerging the bearing and seals in a bath of pressurized oil. By metering the oil through the internal seals, all foreign matter is excluded from the internal rotating parts, enabling long trouble-free service from your rotating control head. Call or send us your inquiry for pricing.